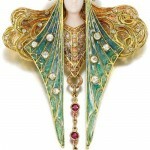 Perfectly amenable styling bright and graceful birds and insects – dragonflies and butterflies, peacocks and swallows. 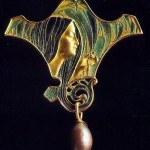 Natural decorative Art Nouveau promoted its use in a variety of genres. Noticeable effect on the modern style has had familiarity of Europe with the Land of the Rising Sun, which has long been closed to Europeans. Japanese sophisticated cult of nature, refined decorative costumes and things around them, fascinated artists and captured their imagination. 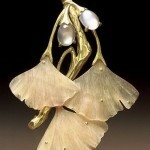 Attracted the ability of the Japanese to see and appreciate the beauty of the seemingly most simple materials. Consonant with ideas of that time were the beauty and the favorite motifs of Japanese art – images chrysanthemums and orchids, waves and rocks, the inhabitants of the deep sea and the snow-capped peaks. 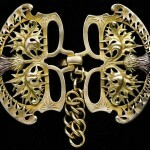 Interpretation of these motifs organically entered the imagery of modernity. New style made ​​itself first in France and Germany, and then almost simultaneously – in Belgium, England, Austria, Scandinavia and Russia. 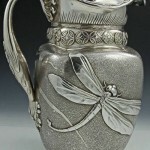 It covered many areas of artistic activity, but most clearly manifested itself in the architecture, applied arts. 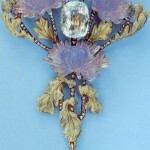 By the 1890s, fashion is no longer a privilege of the upper classes. 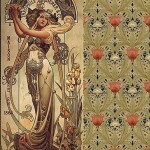 Thanks to the fashion magazines the general public had the opportunity to get acquainted with the latest trends born in the world of Bohemia and in the model houses in Paris, which, like the poets of the time, created the cult of the “infernal” women, whimsical and languid, sensual and exotic. In accordance with the tastes of the era woman silhouette acquired serpentine paths and began to resemble the Latin letter S. The most active modern style invaded design of evening dresses, unusually spectacular due to the asymmetry and mannered curved lines. 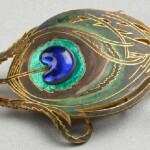 Thanks to the talent of the authors of jewelry art, along with the architecture and art glass, came to the forefront of the development of art, largely defining the decorative features of the new style. 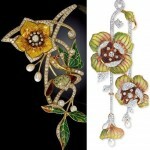 At the initial stage in the imagery of jewelry, as well as in the art of modernity in general, bright development had floral direction. 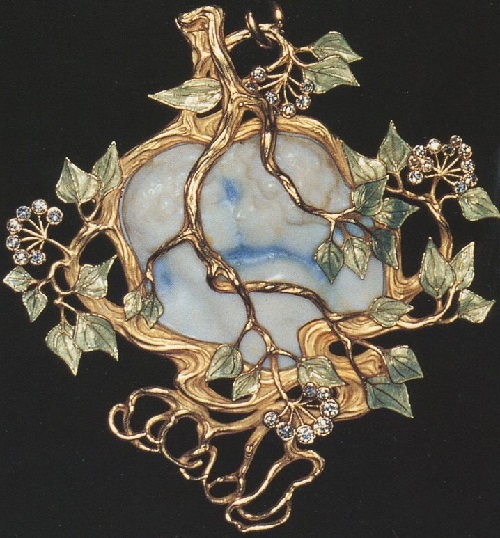 The basis of the motives was nature, and if to the era of historicism was typical naturalistic picture of flowers and insects, the master of Art Nouveau treated them as a kind of signs that carry symbols of the turn of the century. 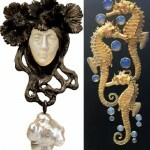 The most recognized Nouveau style jeweler of the time was French painter Rene Lalique, who is considered to be one of the founders of the Art Nouveau style. 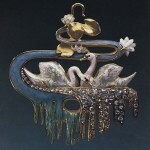 After graduating from the Paris National School of Decorative Arts and working for a couple of years in England, Lalique began his work in Paris as a painter. 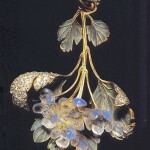 At the age of twenty-five Lalique started his own jewelry workshop. 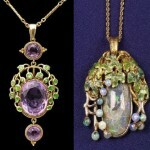 Jewellery by young jeweler for the stars, such as great Sarah Bernhardt, made ​​him famous. 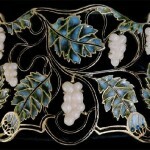 Lalique conquered Paris by unprecedented hitherto ornaments, which captured a colorful world of nature – the realm of flowers and plants, insects and reptiles, fruit and nymphs, a world in which the real mixed with the fantastic. 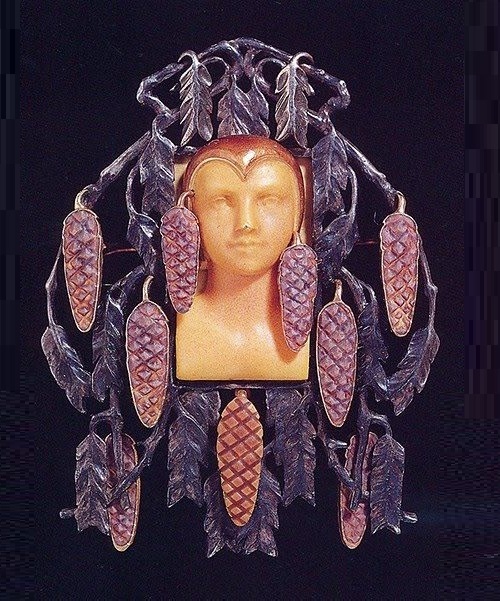 Innovative for his time was the artist’s use of seemingly minor for jewelery materials: horn, mother of pearl, glass, ivory, -which he artfully put together with enamel, pearls, precious and semiprecious stones. 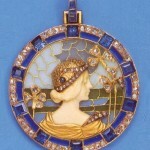 Virtuoso jeweler Lalique used various methods of artistic treatment of metals, and in particular techniques of enamel. 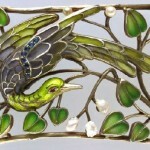 Not accidentally contemporaries called him “a jeweler-poet” and “Paris Cellini.” No less fame earned Rene Lalique as a glass painter in the late 1900s. 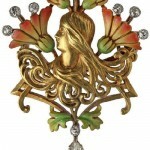 Principles of modernity and creativity determined Parisians Lucien Gaillard and Georges Fouquet (the latter often worked from drawings by the famous painter, decorator and sculptor of the modern era Alphonse Mucha). 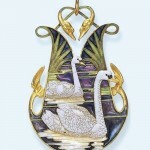 The most consistent exponent of Art Nouveau style in Germany was Berlin jeweler William Lucas Cranach. 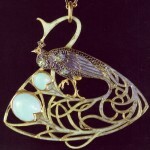 In London, the Art Nouveau style was presented in the works of Charles Robert Ashbee. 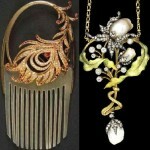 The chronological framework of the modern era is very narrow, little more than two decades, but the value of this style of jewelry is large. 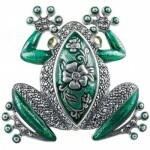 Combining the traditions of East and West, ancient and medieval aristocratic and folk art, summarizing the experience of all previous artistic development, artists and jewelers of the modern era have created a vivid original art.